Boosting your sales is very important when you run an online business. Quite often it is seen that many people visit your website but do not buy anything, just go through your website and leave. This usually happens when your website design, layout, color scheme, description is not proper. In other words you can say that your website is not eye catchy enough. You therefore need to work on it so that it gives rise to more of sales. When the word sales comes up conversion also comes along with it. You can boost your sales without spending a single penny on extra marketing. Conversion rate can be impacted by every aspect of the user experience. It is a critical topic. Hold on…What is conversion rate? Conversion rate is the percentage of visitors that land into your website and complete an expected action. eCommerce conversion rate is the percentage of visitors who purchased something online. 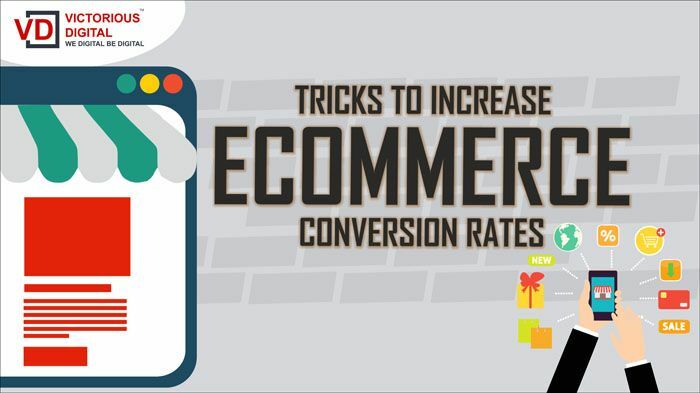 If you are willing to convert the visitors into customers, these tricks mentioned below will assist you in increasing your eCommerce conversion rates. You should have a photograph from every angle. Zoom in, out features. Have pictures of models using or wearing what you’re selling. The best thing you can do here is think of what type of image you would like to see while you are shopping. You can use a clear and detailed picture of the product on your website so that the audience can get an idea of how the product looks like. Customers love to read “free shipping”. It sounds like some sort of deal, even if it isn’t. It is all a psychological game. What you can do is, increase your product prices a bit to cover the shipping charges. Ensure you have enough margin to cover the delivery fee but if you do have the margin, offering free shipping will certainly increase your orders. Coupon codes are surely like a deal. Create attractive coupon codes that customers can use when they are ready to checkout. You can offer a specific percentage of discount or certain amount as off. Name your coupon by some code or something similar. Choose how you want to apply it and set it up. You can even set limits if needed. Live chat software can lead to better conversions. But the only thing is that you need to be available during your business hours. You can’t let the software say you are currently not available because that is a very bad signal. Direct communication will help you build trust with your customers and a real human connection. Allow the audience to checkout as guests. Many a time’s people do not wish to signup and just look around and shop randomly. Forcing a client to signup may make him turn around and just click on the back button. Make sure you provide a detailed description of your product which means providing exact information. Mention the price, material, size, color, availability, etc. This will prevent returns. Think of it like, if a customer was supposed to walk into a physical store, there would be employees to answer questions and help explain how different products work. It’s your duty to look after that they don’t get confused. You need to provide access to your websites on mobile phones too. You may need to tweak how it looks and works on a mobile device for your own specific business needs. Some of the banks and credit cards specially charge a special value on making payment. I am not asking you to eradicate that mode but provide better options. Accept all types of cards. The best thing you can facilitate them is with COD (Cash on Delivery), this option can lead to many conversions. Also provide other payment modes such as PayPal, upi payments, etc. Checkout process can be a barrier to your sales at times. Complicated checkout process is irritating and customers tend to leave it on hold. Often too much of information, details and forms to be filled is frustrating. Try keeping it simple with basic customer details such personal information, shipping details and payment mode, that’s it. Focus on simplicity and lesser clicks for website as well as mobile access. Many a times retailers fail to focus on call-to-action. Call-to-Action acts as a guide to what should be done. With the use of call-to-action you can advise customers to add the product to the cart. Also make sure that Call-to-Action stands out according to the design of the page. Your goal is to get as many people as possible to click it. So it needs to be magnetic. Investing tremendously in attracting traffic is irrelevant, if these individuals do not convert into customers. If you are experiencing low website conversion rates, your problem may be technical, design, copy. Addressing these challenges will help your business increase buyers and help to lower bounce rates and lost opportunities. Whether old or new there is always a chance for improvement. Simple modifications leads to better conversions. Making a change once in a week or a month can increase conversion rate. Your business survives only by the effectiveness of your website. Follow these tricks and you will surely find a difference. For more information, learn conversion process from digital marketing training institutes in Pune.